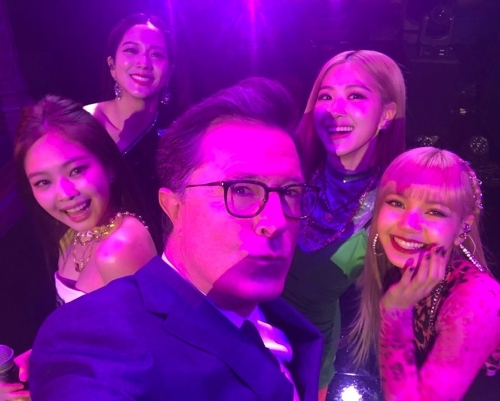 Sensational K-pop girl band BLACKPINK has debuted on U.S. television, performing live on CBS’ “The Late Show with Stephen Colbert,” the band’s management agency said Tuesday. The four-piece girl band staged live their latest, wildly successful song, “Ddu-Du Ddu-Du” on the late night CBS show on Monday (U.S. time) at the Ed Sullivan Theater in New York. This marks the starting point for the girl band’s fresh U.S. career this year. The Monday TV appearance will be followed by the girls’ further representation on ABC’s “Good Morning America” on Tuesday and “Strahan and Sara” to be aired on Friday. On April 12 and 19, they will also appear at the 2019 Coachella Valley Music and Arts Festival in California.